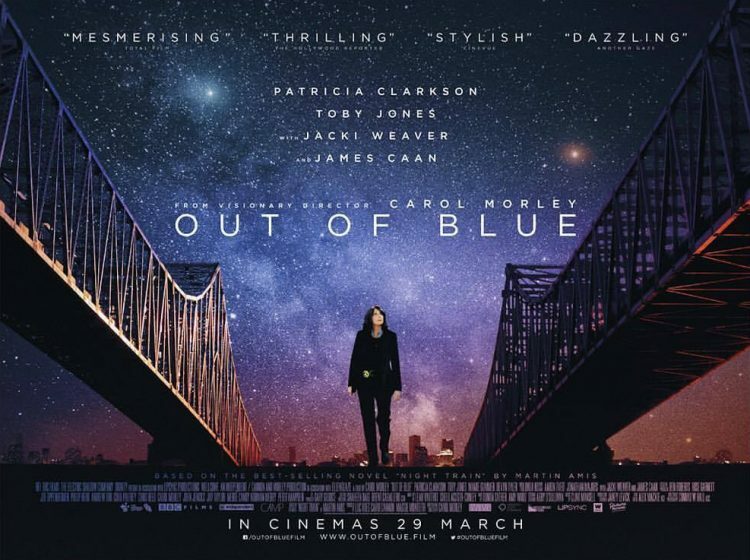 Out of Blue is a mesmerising noir mystery that prizes atmosphere and a singular perspective over its meandering plot, calling to mind Donnie Darko (down to the soundtrack’s use of The Killing Moon) without quite descending into Lynchian madness. Director Carol Morley draws the female detective and cosmology elements as ingredients from Martin Amis’ Night Train, but mixes her own cocktail with a strong visual language and an unusually British lens on a New Orleans setting. Patricia Clarkson is perfect as detective Mike Hoolihan, comfortably wearing the typically male noir tropes whilst her character wryly wards off a complaint, “there’s many ways to be a woman.” Mike’s murder investigation draws parallels with the work of her theoretical physicist suspects, particularly the notion of observation changing results. Not only does observation alter Mike’s understanding of the present (she is routinely pictured closely observing evidence through a magnifying glass) and her own past, but one also reflects on whether the audience members, by observing different clues, each create a different a film. This idea fits with Morley’s desire to make the film “spacious enough that people can insert themselves”. There are definite parallels with True Detective‘s first season, with its similarly atmospheric take on Louisiana, its pervasive sense of dread, and the anticlimactic result of its more inscrutable fantastic imagery which never quite lands. And, just the same, Out of Blue lingers hauntingly afterward.